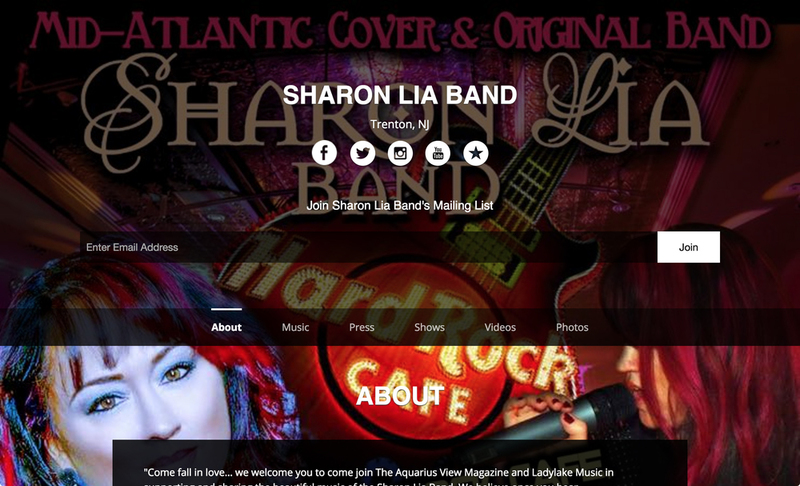 “We welcome you to come join The Aquarius View Magazine...in supporting and sharing the beautiful music of the Sharon Lia Band. We believe once you hear singer/songwriter Sharon Lia, you will be hooked; just like we are.” Sharon Lia, who has been likened to both Christina Aguilera by Jersey Fresh Magazine, and Amy Lee of Evanescence by Independent Share Radio has put together The Sharon Lia Band, gives powerful performances both vocally and instrumentally on her piano/keyboard and performs energetic soulful original and cover music. Dubbed a 'powerhouse vocalist' by The Times in NJ, Sharon has worked with legendary producer David Ivory (Patti Labelle, The Roots & Halestorm) and Stephen 'Eppy' Epstein, (WAR) husband of the late Linda Creed and is a Voting Member of the Recording Academy (Grammy Association). In her extensive solo career, Sharon has performed at numerous ceremonies and festivities including a career highlight singing 'The Greatest Love Of All' for Mr. Epstein, which led to her getting his blessing to record the songs remaining in esteemed songwriter Linda Creed's vault. Sharon had the extraordinary honor of co-writing ‘Welcome To My World', a song left unfinished by Creed and Lonnie Jordan of the band WAR. Sharon then released an album of four Linda Creed Songs and her own originals as a solo act entitled ‘Welcome To My World,' which was produced in part by Johnny Neel of Allman Brother’s fame. Fast forward to late 2013, and the Sharon Lia Band's emergence on the mid-Atlantic's music scene, where the band performed throughout Delaware, Pennsylvania, New Jersey and New York, receiving a standing ovation for their ballad performance of 'Forevermore' at the Hard Rock Cafe in Philadelphia in early 2014. The band performed at the Voltage Lounge as part of the Breakout Artist Competition and was signed as a top tier act by LadyLake Music Publicity. In November of 2014, Sharon wowed the crowd in her solo opening performance in 'Show Me Love,' with popular Freestyle artist, Robin S, at Rho Waterfront in Trenton, which was covered by Musical Seduction, Music Insider Magazine, and OnStage Magazine. International radio play and media coverage predicted that big things lie ahead in 2015, and as fan demand requested, the Sharon Lia Band went on tour from New York to New Orleans to one of the biggest music conferences in the world, released their first EP entitled “Forevermore”, was a guest on The Jimmy Star TV Show and landed in magazine and news/blog articles. Sharon founded the very successful “Ladies Who Rock 4 A Cause” organization and helped Stage 4 Breast Cancer victim Cristi Honea (who Sharon met via her publicist during her own cancer treatments) and another charity “Christine’s Hope for Kids” out of NJ. 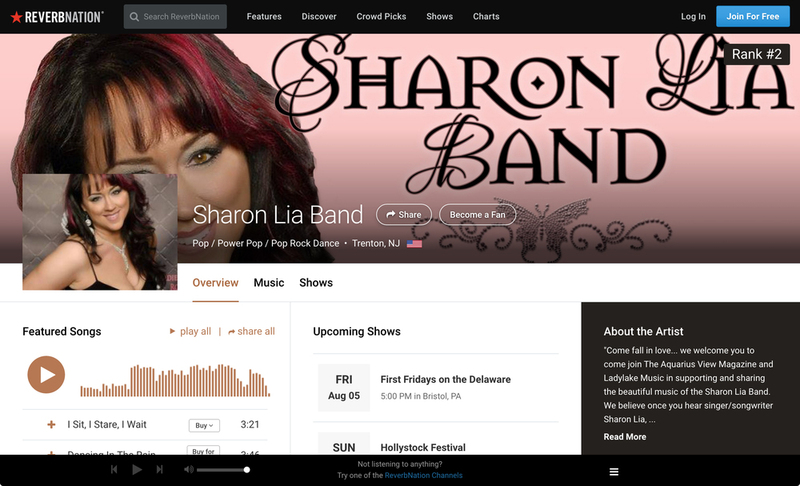 In 2015 The Sharon Lia Band made a difference. This year, 2016, they will be headlining the Hard Rock Café’s Philly in August, have two “Ladies Who Rock 4 A Cause” events, and will perform alongside with the area’s best original bands at Hollystock in August. The members of the band bring a diverse, technically skilled and visceral talent with years of experience, to this band. Rick Jannotti on Guitar, Tony Screws on Bass, Howie Fallon on Drums, and Sharon Lia on Keyboard and Lead Vocals. Together, they believe in the power of music to unite, empower, and ultimately to help others.